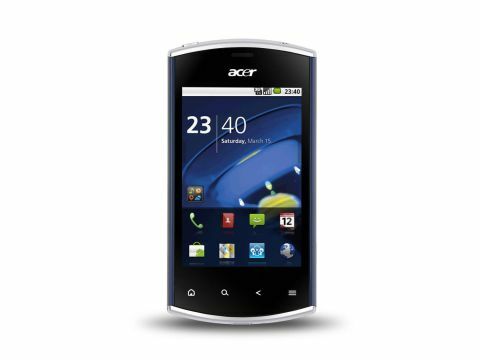 The Acer Liquid Mini is a middle of the road Android smartphone with little to distinguish it from the rest. The more we see the quirky Android skin, though, the more it grows on us. Acer's Liquid Mini is yet another smartphone running Android. Yeah, Yeah, we know. Been there. Done that. Well, hold on, though. This is a £199 smartphone, so it might appeal to tightwad... those on a budget. It's small in size so it is good for those who don't want a huge device. And it sports Acer's bespoke Android skin, which is helpful for some people, not so good for others. The user interface is very similar to that we've already seen on the rather more expensive Liquid Metal, which is currently selling for around £299, and the multimedia-friendly Stream, currently going for rather less at around £240. In price terms the Liquid Mini sits more comfortably against the likes of the LG Optimus One. The Acer Liquid Mini is available in five different colours, and these have fancy names: royal blue, piano black, lime green, jet silver, light pink. The colour relates to the backplate and long edges. The top and bottom edges are always silver, the front black. The top and bottom edges are curved slightly, and while this has no effect on usability, it does make for a slightly unusual appearance. That's just as well since, in general, the Acer Liquid Mini looks very familiar. Under the screen there are four touch buttons for Home, Back, Menu and Search functions. Unlike in some more expensive Android smartphones, these aren't dimmed out when the screen is off. They're always present, though a bright white backlight does kick in when the screen is turned on. Three of the edges contain buttons and connectors, but the left long edge is entirely blank. On the right sits a pair of volume buttons and a shortcut for the five-megapixel camera. On the top is the power switch and a 3.5mm headset connector. The bottom has a micro-USB slot. The plastic backplate has a soft finish, which makes it feel comfy in the hand and helps with grip. The OS of choice is Android 2.2, and you'll find GPS, Wi-Fi, Bluetooth and HSDPA all lurking under the hood. Cost savings have come into play in the choice of a fairly low-spec 600MHz Qualcomm 7227 processor, relatively low 480 x 320 screen resolution and shortage of built-in storage at 512MB. But you get a 2GB microSD card, and at least the screen is capacitive, and Acer has thrown a protective sleeve into the box. On the whole, then, it seems Acer has made some compromises to meet its price point. The question we have to ask is, are they the right ones?